Welcome to the website of John Calvin Presbyterian Church (JCPC as we know and love it). We hope you will browse through the site for all that is happening in the life of our energetic faith community. 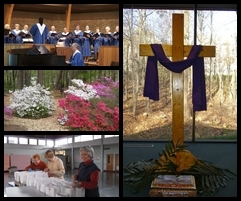 JCPC is a lively congregation nestled in Annandale, VA, a suburb inside the beltway of the Washington, DC metro area. Our natural setting and peaceful sanctuary in the midst of a busy, cosmopolitan area complements our hope for peace and justice in life and in the world. Our hope has its foundation in God, whom we know in Christ, and whose Spirit is alive and moving in and among us. Through faith in a living God, we believe all things are possible. This is a congregation of folks who seek God in the ordinary and in the mysterious, and celebrates that presence together in divinely inspired worship. We take seriously God’s inclusive hospitality and try to serve God through acts of humble compassion. And, the support we get and give one another binds us together as a church. Now that you have found us electronically, I hope you’ll find something that interests you and that you will connect with us in person.